Materials fee of $55 inc. all materials, use of tools, detailed handouts and resource lists. 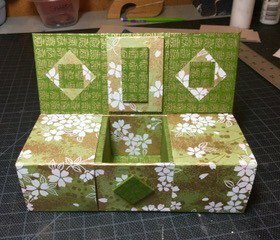 Learn how to make the Karakuri Bako, a Japanese ‘magic box’ which contains a hidden compartment, based on the classic Jacob’s Ladder design. We’ll begin with basic box making techniques of cutting, paper selection and coordination, gluing and construction, using bookboard, Japanese Chiyogami and Nepalese Lokta papers. The key to this beautiful box lies in accurate measuring, sharp creasing and an eye for symmetry and color. Additional box instruction and materials will be available, as time allows.